Paul Manafort's lawyer filed a motion to dismiss Wednesday, asking a federal judge to throw out some of the criminal charges against Manafort. Paul Manafort's attorney asked a federal judge in D.C. to throw out some of the criminal charges against him. Manafort's lawyer filed a 46-page motion to dismiss Wednesday. He says special counsel Robert Mueller shouldn't be able to indict Manafort for what he did before joining the Trump campaign in 2016. The filings acknowledged that Mueller was given permission to investigate "anything that arises in the course" of the Russia investigation but says that extra power is like a "blank check." The motion also stated that some of the charges against Manafort are duplicative, since he is involved in two separate cases — one in D.C. and another in Virginia. 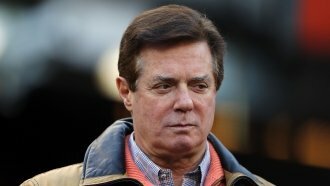 His lawyer said, "Manafort thus faces a game of criminal-procedural whack-a-mole" against Mueller. The motion to dismiss is similar to a lawsuit Manafort filed against Mueller in January. CNN reports these types of motions are pretty common in cases like this. But it also shows that Manafort is planning to fight the charges instead of pleading guilty like his associate Rick Gates, who was indicted with Manafort last year.